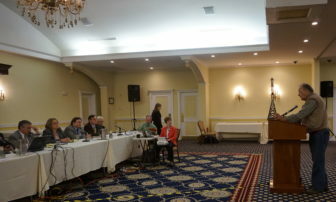 Singer/songwriter Katie Rose of Whitefield sang her opposition to Northern Pass to the Site Evaluation Subcommittee at a public hearing Thursday at Mountain View Grand Resort and Spa in Whitefield. Roger Hines of Bethlehem testifies in front of the Site Evaluation Subcommittee at a hearing Thursday in Whitefield. WHITEFIELD – The state Site Evaluation Subcommittee that will determine whether Eversource can build the 192-mile Northern Pass transmission line from Pittsburg to Deerfield voted Thursday to extend the deadline to make its final decision from Dec. 17 to Sept. 30, 2017. Eversource opposed extending the deadline and said it will look at options for reconsideration. A daytime and an evening hearing were held Thursday at the Mountain View Grand Resort and Spa in Whitefield. There were plenty of anti-Northern Pass signs along Route 3 on the way to the Mountain View. The Society for the Protection of New Hampshire Forests – joined by a number of other interveners – had sought clarification of the subcommittee’s temporary schedule. That led to testimony by interveners who complained about the difficulty in formulating their legal arguments in such a complex proposal. Before the vote, PUC Commissioner Kathryn Bailey, who sits on the evaluation subcommittee, spoke in favor of allowing more time to make a final decision on Northern Pass. Joanne Bradbury, one of the Deerfield abutters, said her group has been working hard, but finds the process complicated and time-consuming. “I just wanted to point out that apart from all the attorneys in the room and people whose careers involve this sort of thing, we are ordinary people,” Bradbury said. The Site Evaluation Subcommittee, which is made up of the heads of different state departments, also denied a motion from Northern Pass for a waiver to submit a decommissioning plan. Northern Pass would bring 1,090 megawatts of hydropower from Hydro-Quebec in Canada to New Hampshire then on to the New England grid. Northern Pass spokesman Martin Murray sent an email news release Thursday evening that quoted Eversource’s president Bill Quinlan as being unhappy about the timeframe change. “Today’s decision by the NH Site Evaluation Committee to extend the timeframe for assessing Northern Pass is disappointing, since it will only delay the realization of the substantial benefits of this project in New Hampshire and throughout New England,” said Bill Quinlan, president, Eversource New Hampshire Operations. “We look forward to the written order outlining the details of this schedule, and in the meantime will be evaluating our options for seeking reconsideration,” Quinlan said in the release. Jack Savage, spokesman for the Society for the Protection of New Hampshire Forests, said it is important to have more time to prepare for the adjudicatory proceedings, which will be run like court hearings with the subcommittee acting as the judge. Savage said it makes more sense to decide on more time at this point rather than pushing ahead and then delaying as the process moves forward. 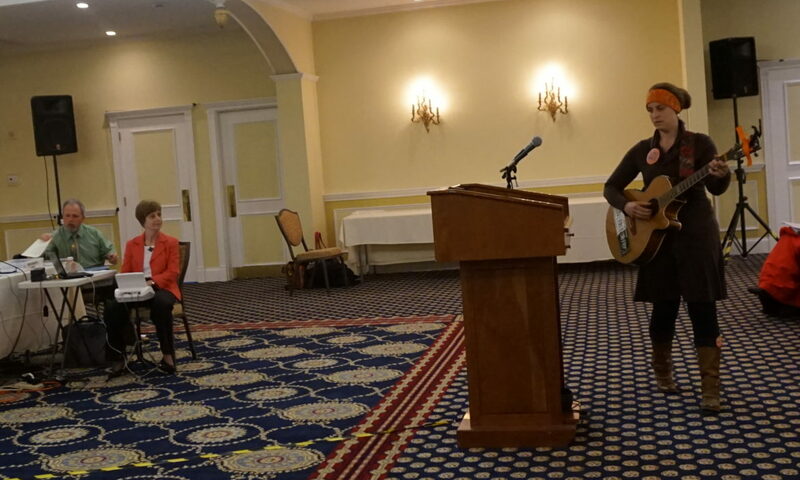 About 125 people attended the public hearing portion for citizen testimony that started at 6 p.m.
Whitefield singer/songwriter Katie Rose brought her guitar to the podium and sang a song opposing Northern Pass. “To the powers that be, do you not see,” Rose sang. Roger Hines of Bethlehem brought a model of a powerline to the podium. He doubted Eversource’s claim that it will bring jobs to New Hampshire. “These won’t be built by New Hampshire people,” Hines said. Jerry Roy of Whitefield said before the testimony started that the tall power lines will be visible in much of Whitefield. Property values will drastically decline, he said.